I’m not sure if that’s Santa Monica or just east of there. Either way, a nice reminder that the Santa Monica Freeway has been constipated for decades. The Expo Line today is one way today to avoid the 10 to SaMo and the Purple Line Extension will a few years hence be another alternative to the not-so-great interstate. That’s Hollywood as in Portland, btw. Hmmm….nice looking building but there are better vantage points than the one one zero. The Little Miami Scenic Trail runs past the remains of the old Peters Cartridge Co. factory. Photo courtesy Steve Hymon. Attentive Source readers know that I’ve been holding court from Cincinnati the past week (parents stuff). One of the loveliest parts of the region is the 75-mile-long Little Miami River Scenic Trail, a rails-to-trails bike path that extends from Cincy up through the ‘burbs and into the sticks. It’s the third-longest continuous bike path in the country. The path is used mostly for recreational purposes — it’s not really practical as a commuting option. There are plans afoot to extend it into downtown Cincy (there are obstacles to overcome) and fill in gaps that would allow for a network of bike paths all the way from the Ohio River to Lake Erie. That would be very swell, indeed. I would argue that the Little Miami River is a tad more scenic than the L.A. River, which got channelized decades ago by the beaver boys at the U.S. Army Corp of Engineers. But the L.A. River has its pluses. It has views, wildlife, some sections with a natural bottom, proximity to tens of thousands of homes. And when the L.A. River Bike Path is extended into downtown L.A. in the 2020s courtesy of Measure M, it will be a commuting option from the north and south and also a fun place to ride recreationally. That will make the L.A. River bike path 32 miles long. There is already a 28-mile bike path along the San Gabriel River from Azusa to Long Beach. I would love to see more of these long-distance paths across our region — and beyond. The one I’d love to see more than anything is a trail from the Antelope Valley up to Bishop in the Eastern Sierra; there is even an old railroad bed available some of the way that could be railed-to-trailed. You could take the Metrolink from Union Station to Antelope Valley and then ride to Bishop. Do it people! As for the Little Miami trail, I highly recommend going for a spin if you ever find yourself in southwestern Ohio. You can rent a bike from Montgomery Cyclery in the village of Loveland. I went 20 miles north, lunched at the Little River Cafe near Oregonia and then went back to Loveland, where I had a tasty refreshment at Narrow Path Brewing Co. Here are a few more pics if you’re interested. One other thought: downtown Loveland was Nowheresville when I was growing up. 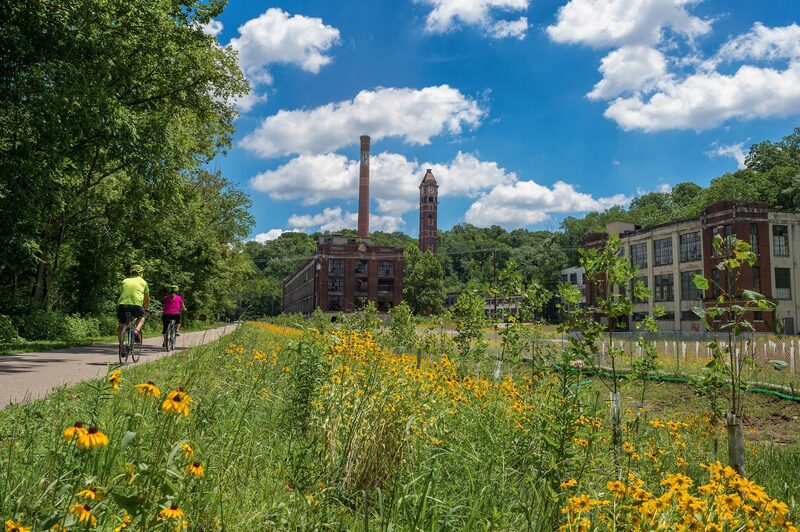 Now it has new restaurants, housing, the old buildings have been rehabbed — mostly because the lovely Little Miami Scenic Trail has proven to be a regional attraction. There’s no reason the same thing couldn’t happen in L.A. Reminder: service changes went into effect on the Metro Bus system on Sunday. There is now all-night service on the Orange Line and Silver Line. More here. The Metro Board last week approved a master agreement with the independent Construction Authority building the Gold Line extension, as well as a $1.4 budget. As noted in the staff report, Metro intends to seek a state cap-and-trade grant of $249 million to fully fund the project. If the grant doesn’t come through, some cost saving strategies are being developed — project amenities could be trimmed — and Metro is also looking at other potential sources of funding, reports the Tribune. Road diets implemented by the city of L.A. to help reduce the city’s liability in serious crashes haven’t pleased everyone. Commuters say traffic is worse than ever in the Silicon Beach area, the city says that traffic will improve after a few weeks. I encourage you to read L.A. Council Member Mike Bonin’s take on it — i.e. that safety matters. A lot. On the other hand, here’s an opinion piece in the Daily News arguing that the city of L.A. is trying to eliminate the private car as a means of transportation. I think it’s perfectly fair to question the impacts of any particular road diet. But saying a diet is the same as trying to eliminate private cars? C’mon. Of the nation’s subway systems, the Washington D.C. Metro is actually on the new side — the first leg opened in the mid-1970s. But maintenance was often deferred and the system has faced a number of service and safety issues over the past decade. Finding funding to fix things has also been a challenge. Which brings me back to Measure M. Unlike previous Metro ballot measures, this one actually sets aside revenues for State of Good Repair projects. The idea is to always have a pool of funds for the kind of ongoing work necessary on bus and rail lines that run 24/7/365. As part of its efforts to make Uber drivers less unhappy, the company is now allowing passengers to tip drivers through the app. What remains uncertain: does this mean the company will pay drivers less and use tips to make up the difference? Or will this raise the cost of using the largest of the Cheap Taxi companies? (Lyft already allows tipping). Also, check out the comments, which are pretty entertaining. Attentive Source readers know that I feel like the Cheap Taxis can’t possibly sustain the low prices that have made Cheap Taxis so attractive to so many, perhaps at the cost of transit. That first picture from twitter is not Santa Monica. It is the 110 (then the 11) northbound where the 4 level dumps in. The building on the left with the red sign is at the corner of Alpine St and Bartlett St. Looks like it was shot from Sunset Blvd. Here is a link to the google map of the area. Yes, Just, that was a good catch. I admit I was puzzling over the location of that photo until I saw your comment. The giveaway that gave me doubts about the caption’s accuracy was the style of highway lighting. I knew they had abandoned that more ornate style by the time the SM Freeway was built in the 60s, I believe. Awesome. So, infrastructure that helps facilitate maximizing ridership, and maintaining/improving congestion in city centers like downtown LA and Pasadena, are “amenities” and/or Metro could “skim” funding from road improvement projects that would have a positive impact on a greater number of people than the Goldline extension? That is absolutely ridiculous. And no doubt, if the above were to occur, in 202? when the Goldline extension opened Metro would be patting itself on the back because the increased Goldline ridership would be sooo much higher than their projections. All of this just reinforces the impression that getting the infrastructure (new toys) is more important to Metro than maximizing “…an efficient and effective transportation system for Los Angeles County”. How about: if you don’t have the funding to properly implement the project, there’s an outside review of whether the funding could be more effectively deployed to other projects that would have a bigger impact on the transportation system? Last time I drove to Playa Del Rey was just before the restriping began, but morning traffic on Culver Blvd was already clogged. I took Jefferson, but now I wonder if that might be just as bad. If all outlets are slowed, it could be an issue for emergency vehicles (and as I understand it, this is why Culver is closed the night of July 4th). I also noticed that the only Metro bus serving the area, line 115, came up from Manchester and then drove back. It might make sense to have line 110 continue west on Jefferson to meet up with the 115, to give transit riders another option for getting in or out of there.